The upcoming winter exhibit at Carrie Haddad Gallery will feature works by three diverse artists; Darshan Russell, Eileen Murphy and Donise English. The title of the exhibit “Three Contemporary Artists Who Just Happen to Be Women” emphasizes the gender of the artists in the exhibit. Gallerist Carrie Haddad enjoys giving equal exhibition time to women so she has planned this show to follow up on two artists who have been with the gallery for some time; Darshan Russell and Donise English, and to introduce a new artist to the gallery, Eileen Murphy. The colors and feeling of Darshan Russell’s compositions are greatly influenced by Matisse, but her inspiration comes directly from life and the simple scenes that surround her in Poughkeepsie, Kingston, Hudson and other Hudson River towns where she paints. Occasionally, Ms. Russell will paint cities that she has traveled to like New York, Baltimore, Portland and Paris, but the bulk of her work documents local scenes and local people. 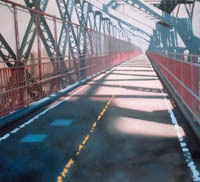 Family photos and photographs from the Poughkeepsie Journal or the New York Times inspire much of her figurative work. Portraits of Madelaine Albright, Barak Obama, and Mayor Dinkins are part of her repertoire, as well as less prominent individuals. Three Contemporary Artists Who Just Happen to Be Women will run from January 8th through February 15th with a reception for the artists on Saturday, January 10th for 6-8pm. All are welcome to attend.